As it turns out, we saw the wreck being taken away by flatbed as we were returning from the hospital... That is the first picture. On the individual picture pages, select the 'All Sizes' link to see the large size. any fatalities? that wreck looks nasty! The patient was alive when we delivered them to the hospital and, from what I understand, was still alive yesterday. I haven't had an update recently, though. As much as I hate to say it, surviving this accident may not be in the patient's best interest. The patient was removed from life support last night. Just curious, how did the car hit? The hood is surprisingly intact. Did the car skid sideways? It's hard to say what happened. 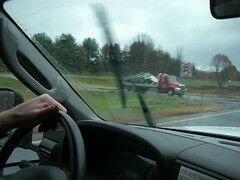 As best as we could figure out, the car hydroplaned into a guardrail and was launched out over the median. The car flew about seventy feet, hit the ground about ten feet in front of the tree, and struck the tree bottom-first. The tree fared much better than the car did, only losing about 2 - 3 sq. ft. of bark.